An EYCE representative participated on a meeting of World Council of Churches (WCC) Working Group on Climate Change which came together to plan and synergize next steps in climate change advocacy. The meeting hosted by the Institute of Theology and Ecology of the Orthodox Academy of Crete in Kolympari, Greece took place from 1st to 3rd October 2012. “Participation in the meeting helped EYCE to link its activities regarding ecological justice to global initiatives beyond Europe. In addition, it was a perfect opportunity for networking and giving EYCE campaign more visibility,” said Benjamin Mlýnek, a member of EYCE’s Executive Committee responsible for the campaign. Fifteen representatives from various churches and Christian NGOs from Africa, Asia, South and North America, Europe and Pacific evaluated work on the theme done so far as well as outcomes from two recent major conferences: UN Conference on Climate Change (COP 17) in Durban, South Africa and the UN Conference on Sustainable Development (Rio+20) in Rio de Janeiro, Brazil. Members of the working group stressed the need to overcome frustration towards the poor outcomes of the conferences and to enhance cooperation among ecumenical partners in support of responsible and effective international climate and sustainability negotiations. Moreover, the working group planned future steps in global advocacy. The need of advocating for the establishment of a Special Rapporteur on Climate Change and Human Rights by the UN Human Rights Council was reaffirmed. The working group also developed an action plan in order to get ready for the WCC General Assembly in Busan, South Korea which will take place in October/November 2013. 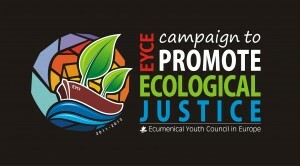 For more information on the meeting or on the campaign contact the Campaign Coordination Team on campaign@www.eyce.org. ← Young people gather to overcome poverty!